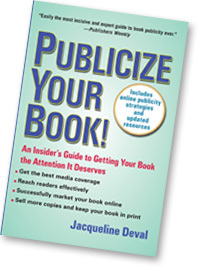 Introduction to PUBLICIZE YOUR BOOK! The reality of book publishing is that there are too few resources to support every book. This means that some books will get publicity campaigns and budgets while others will go without. Additionally, most publishing houses are not staffed with enough publicists to mount a full-fledged campaign for every book. Because of this, editors must compete with one another to lobby the publisher, and the marketing and publicity departments, for the funds and staff attention to promote their books. Some aspects of publishing boggle the minds of first-time writers. (That’s OK. It boggles the minds of many veterans in publishing, too.) For example, you might wonder why the big-name authors get tons of money spent on their campaigns when their bestseller status would seem to be a foregone conclusion. Meanwhile, a new author could use some of those marketing funds to begin to build a reputation. The bald fact is that publishers need to protect their interest in the big authors and spending marketing dollars is one way to keep the author and agent happy. The harsher reality is that this dynamic is unlikely to change anytime soon. The good news is that authors who know how to properly represent themselves to their publishers can find discretionary dollars for book promotion. Do not count on your agent to make this happen. Your agent may be terrific, but is truly unable to fight every battle on your behalf. You will need to become your own advocate with the right efforts at the right time. Too many authors simply wake up too late to the problem of under promotion. An author who can get involved creatively and make allies of the publishing staff can have the most impact on the marketing and publicity program and the best possible chance of reaching a readership. It’s never too soon to get started. These days, many proposals submitted to publishing houses are accompanied by a marketing plan written by the author in cooperation with his or her agent. This is particularly true of nonfiction in categories like self-help and how-to, which require a promotable author to publicize the book. In the absence of a marketing plan, which demonstrates the author’s willingness to participate energetically in the book’s successful publication, the publishing house has fewer reasons to publish the book. Therefore, you may find yourself writing a marketing plan before a publisher has signed up your book. Even if you didn't write a plan to submit along with your book proposal, count on starting your marketing efforts early. More than ever, an author's serious marketing efforts can truly shape the trajectory of a book's life, but it takes time and effort. Start planning your book's marketing a year before publication and you'll be glad for the time you've allowed yourself to get prepared. You may have heard from other writers, or your agent, or your editor that writing the book is only half of your job and that the other half is marketing it. That statement is not entirely valid because the marketing of your book never has to end. The campaign can last as long as you like after your publicist has finished his or her job. You are limited only by the effort you put out. Even with successful books, the publisher eventually steps back to focus on bringing its other titles to market. By paying attention to the market and learning a few marketing and publicity tricks and techniques, you can keep the marketing effort for your book moving forward indefinitely. While marketing at first may seem like drudge work—and there are tedious aspects like assembling mailing lists—you may instead find that marketing delivers an enormous amount of fun and pleasure, and brings you rewarding new relationships and -- most important -- into closer and even ongoing contact with your readers. Marketing is particularly thrilling when you come up with a bright idea, carry it through, and, as a result, enjoy a boost in your book’s sales. If your publisher intends to put some muscle behind your book, you will nevertheless need to get involved in shaping your book’s campaign. The promotional opportunities that are available to your book might require some research—a task your in-house publicist might not be able to accomplish in the hours available to her. Nor is your role limited to providing viable leads for promotion. You are a valuable resource in many other ways when it comes to determining how to market your book. While you may never have had a book published before, or been involved with the marketing or publicity surrounding any kind of product, you might view yourself as an adventurer. You are embarking on an unusual enterprise. You will face risk and excitement in your chance to reach fortune. My role is a guide of sorts: a companion with sound advice on how to make it through what can sometimes seem like rough going. I finally decided to write this book because a friend needed my help. With his novel on the verge of publication, he found himself bereft of publishing support, his editor departed for another house, and his publicist reluctant to meet him. I realized that our conversations were identical to many I’d had before with writers who felt either abandoned or unsure when their books were on the verge of publication, who wanted to promote their books, and yet lacked the deep pockets to afford a freelance publicist. Despite the ominous signs, my friend set about to create some publicity for his book and even managed to garner some resources from his publisher to do so. I wrote this book to help other writers like him. Because I’ve been a publicity director, an author, and a publisher, my perspective encompasses the desires of the author (who wants to see the book sell and to reach a readership) and the reality of the publisher (who is constrained by budgets, time, and other books competing for attention that may have more obvious opportunities in the marketplace). Those two sometimes competing interests can be reconciled, with some up-front management of expectations for both parties. While I talk about all aspects of marketing a book, I’ve concentrated most on publicity opportunities—the realm in which an author has the greatest chance to make a significant difference. Because one size does not fit all in book publicity, not all of the advice here will be appropriate to your book. For example, fiction and nonfiction have different opportunities. So do children’s books and books intended for adults. While you read this book, keep a notebook of the ideas that seem appropriate to your book’s promotion. This book will explain what you might reasonably expect from your publisher during the course of publication and how to get involved with the planning. It answers those nagging questions that might seem too petty to trouble your editor with and provides creative solutions to many issues that will arise. Most important, this book will show how you might work effectively with your publishing team to create marketing and publicity opportunities that can drive book sales. Since the first edition of this book was published in 2003, the world of book marketing has evolved dramatically, with online tools offering authors ever more sophisticated and immediate ways to reach readers, whether through blogs or social networking or book trailers. While traditional media outlets for books, like newspaper book review pages, are being eliminated or reduced, the new online forums for books have increased exponentially. And some of the online commentary about books is as engaging as anything you'll read in traditional print media. So the good news for authors is that the potential for direct access to readers has been vastly improved. By getting involved in publicizing your book early and armed with the right information, you can get your book the publicity and promotion it deserves.